Cell Phone Radiation: We Know the Dangers, What are the Solutions? 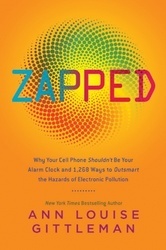 Ann Louise Gittleman Ph.D. has a Master Plan for Safety - ZAPPED a new book by health expert, Ann Louise Gittleman Ph.D. is the first comprehensive, step-by-step guide to protecting yourself from everyday exposure to hazards like cell phone radiation. Award-winning author, nutritionist, and First for Women magazine columnist Ann Louise Gittleman combines the best of energy medicine with the latest scientific research in a user-friendly plan designed to safeguard you and your family. In 2005, Ann Louise Gittleman was diagnosed with a benign tumor of the parotid, one of the salivary glands located just below the earlobe. It's a very rare tumor most often caused by ionizing radiation from X-rays, which she hadn't been exposed to. But, she had been addicted to her cell phone, and on it constantly, for years. In fact, the very electronic and digital innovations that have made modern life more convenient and efficient are also exposing people to thousands of artificial electromagnetic frequencies and wavelengths never before experienced by human beings. Cordless phone chargers emit radio frequency power even when not in use. The pulsed digital signals are more damaging than the analog signals, and they should not be anywhere near the head of the bed. Baby monitors should not be placed closer than 6 feet to the crib. The backs of refrigerators produce large electromagnetic fields which go through walls—so if a family room shares a wall with the refrigerator, the sofa should not be against that wall. It is also recommended to stay out of the kitchen when self-cleaning ovens are operating; these oven settings use very high wattage to burn debris off the oven walls. It may be called a laptop, but pregnant women especially should keep a good distance. Even before birth, children are exposed to electropollution in the womb. Since a fetus spends 40 weeks essentially floating in a sack of water (a well known conductor of electricity), it is particularly vulnerable. Everyone's at risk when it comes to electropollution, the new invisible pollutant. It was once thought cigarettes, lead paint and tanning beds were safe. Electropollution has the potential of being even more deadly for people now, future generations and our planet.